HEBREW 10:23 Standing on the promises of God. God is faithful. In April of 1997 a new singing family was unveiled. The Armstrong Family. This Traditional Gospel Singing family has their own Unique style of singing which gives them the opportunity to reach Christians and sinners of every nationality with the message of Christ. Currently, you can find these singing women doing more than just singing. They minister in their local community as well as other states and countries. They can also be heard on local radio stations throughout the community, as well as seen on community cable television and other local TV stations. They would consider it a blessing to minister in your church and at your conferences this year. Their mission is to continue to sing the gospel under the anointing of God and to see the power of God flow and bless His people. 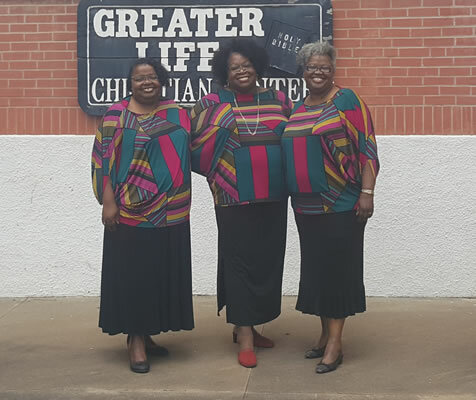 They are a full service ministry with a licensed minister in the group and prayer warriors who all love to sing. They are the Armstrong Family Singers Ministry! The Armstrong Family Singers are often invited to sing in various sized churches of different background. The group is willing to travel...won't you invite the Armstrongs to minister in song at your next special event? You will be glad you did! Daughter of a Baptist Deacon Daddy and Evangelist Mother, she accepted Christ at an early age. She is enjoying ministering and singing with her family, and hopes to do more traveling and spreading the word of God thru song. Brenda is the groups treasurer. Brenda enjoys watching old movies and shopping. Daughter of a Baptist Deacon Daddy and Evangelist Mother, she accepted Christ at an early age. She is enjoying ministering and singing with her family, and hopes to do more traveling and spreading the word of God thru song. Ruby is the booking manager and secretary for the group. Ruby enjoys writing a article for a local newspaper. Daughter of a Baptist Deacon Daddy and Evangelist Mother, she accepted Christ at the age of 12. She is enjoying ministering and singing with her family, and hopes to do more traveling and spreading the word of God thru song. Patricia is the driver and wardrobe coordinator for the group. Mothering her two beautiful daughters Marissa and Mariah is also a job she enjoys. Patricia enjoys cooking and shopping with the girls. Valmarie enjoys driving for the group and helps work the product table and works with Marissa on the photography for the group. Children: 3 (two daughters and one neice she raised as a daughter. Marissa is the daughter of Patricia Singletary and travels with the group assisting with the product table and photography.